Let’s face it: sometimes we all need a dessert that only makes two servings. Sometimes we just can’t handle 12 servings. Sometimes we eat them all by ourselves. Sometimes we eat them all by ourselves in two hours. Sometimes we eat them all by ourselves in a matter of minutes. Sometimes it’s the best thing ever. FYI: I have no idea what that is like. Haven’t you always wished you could make just enough dessert for yourself? Or yourself and one other person? But more often than not, I’ve found it to be a hassle to drag out the mixer, cream the sugar and butter, sift the dry ingredients and all that fun stuff for a measly two cupcakes. What can I say? I’m lazy. Well, I was lazy. Until I decided to make these cupcakes for two. This is only my second or third cupcake recipe completely from scratch and completely from my own recipe development, and I am so excited with the result. It is definitely your typical white cake; fluffy and soft, full of vanilla flavor, and the perfect vehicle for some fluffy white frosting. And it only takes one bowl! Not creaming, no mixer, no folding… just you, a bowl and a spoon. Try not eating some of that batter. Yeah right. I think what I love most about these cupcakes is their customizability. Mr. How Sweet and I can have different flavors of frosting or even some different fruit, nuts or chocolate chips added in our cupcakes if we’d like. Meaning that I can make mine fun and fancy and he can keep his plain and boring. Nothin’ new there. 1 teaspoon vanilla, yes, a full teaspoon – they are super vanilla-y! In a bowl, add egg white and sugar and whisk until combined. Add in vanilla and melted butter and stir until mixed. Add flour, baking powder and salt and stir until smooth. Stir in milk. Divide batter equally between the 2 cupcake liners. Bake at 350 for 10-12 minutes, or until cake is set. Let cool completely, then frost as desired. I used some leftover white chocolate frosting. I have an inkling that these “easy” cupcakes may be made nightly. Does that defeat the purpose? I like this article..because also like cupcakes. i dont have any milk now. so, idont want to add milk.does it matter?? Hello, I’m Lana. You don’t know me but I’m actually dong a project on how leaving out different ingredients affects a cupcake. I haven’t conducted the actual experiment yet and I’m planning on doing it this weekend. If you have any time or interest in following my project, please don’t hesitate to email me @monkeyfacesvetlana@gmail.com. This was a perfect recipe!! I loved it so much!!!! I really like this recipe! I do add a little bit more sugar and vanilla. I like sweeter cakes. It is more of a denser cake so it is nice when you make a mini 4 inch layer cake! It really holds up. Thank you! I made these for my parents 25th aniversary! They loved them! My mom is going on a camping weekend with her sisters and usually I make some goodies for her to take. 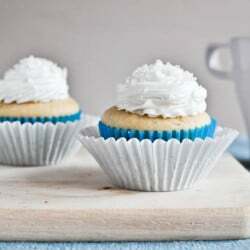 Finding a good quality, moist vanilla cupcake is kinda hard for me and this recipe rocks! If I wanted to make 10, would the best way Be to make 5 batches of 2? When I made the recipe it turned out great, but the batter was really runny. Is it suppose to be that consistency? Yay!This recipe turned out amazing!I was craving some cupcakes so I searched for a cupcake recipe for one but seriously?One isn’t enough haha!More for me!Thank you so much for this recipe I DEFINITELY recommend it.Greetings from Montreal! I loved baking these cupcakes! They were super easy and perfect for whenever I’m craving something sweet. I however must say, I had to bake these cupcakes for at least 25 minutes before they were completely cooked. I followed the recipe and baked them for 12 minutes, but they were so runny and the center was really goopy and sticky. So I baked them for another 5, another 5, and another 5. After 25 minutes of constantly checking and baking, the cupcakes were ready. They were very delicious, but I wish the recipe would have a higher temperature to bake the cupcakes so they would be ready sooner. I had to cook longer as well. But turned out great! I added a handful of mini chocolate chips and topped with a buttercream I whipped up while they were baking. Thanks for sharing! I really love the vanilla cupcake. it’s really going to be awesome in taste.You have really done a nice job. As you have shared the best things for me. Even this recipes can be made in busy time also. It’s really special for me. thanks for sharing it here on this site. Receita muito boa de se preparar, achoque fica mito gostoso, vou preparar, espero que fique tão bom quanto esse. If you’re looking to make just two cupcakes this is definitely a great recipe for a quick and easy batch. It did take me 25 minutes for them to bake fully, and if I make then again I won’t add as much vanilla. I use pure vanilla extract and that much gave them an almost bitter aftertaste. Still a great little recipe. Perfect!!! Just what we were looking for! We did have to bake them for 20 minutes but after that they were perfect and we enjoyed them without the temptation of eating more. Haha! Thanks for the great recipe, will definitely use in the future when we’re having a craving for dessert. Can I add Strawberry’s to this? I think that this cupcake for 2 recipe wasn’t only the best cupcakes I’ve ever had they were better!!!!!! Thank you so so much! This has been my go to recipe for all things cupcakes! I love this because it makes 6 mini cupcakes and lets me experiment with flavors and I don’t ruin a full batch of cupcakes. You are my hero and I LOVE this recipe! The cake was very dense, and not sweet enough. It wasn’t the best I’ve ever had, not quite close either but it was convenient to make. This is lovely, my kids is going to love this. Loved them. Made 6 mini ones and they were perfect. Awesome! Made these for my mom to surprise her on her birthday. Tasted great! They were fairly quick to make, which was such a relief as i was in a time crunch. Has anybody made a full batch of these? I love this recipe but I’m worried to create the measurements on my own. I’d love to do a dozen for Christmas. Any help is appreciated! This is cool for a weekend getaway with my little family. Can be combined with heavy food and fresh fruit juice. This was delicious.. moist as I added a bit more milk.. I love this recipe! My three year old is allergic to milk. I make her these cupcakes to bring to bday parties so that I can be sure she can eat cake too. I substitute dairy free butter and milk and they always turn out delicious. Being able to only make two at a time is oh so convenient!!! I divided the batter among 2 one cup ramekins and then assembled the cakes to make a mini two layer cake with vanilla buttercream frosting. Delicious. Thank you for sharing your recipe. Pingback: Vanilla Cake for One (Review) and a Variation | Cooking is Fun … Really! !